The “Blog” of “Unnecessary” Quotation Marks: ooo "special price"
You know, I've heard there are states where brazillian waxes are illegal. So maybe this is a real-life code. Though $8 for one of those really is special. Thanks, Aaron. Oh my gosh! I wouldn't like having my brows waxed there! Who knows what they would use for it! That appears to be in LA; if California had a law against Brazilian waxing, the entire San Fernando valley would be a police state. Only one quotation mark on "special price"? Where's the rest of the notice? 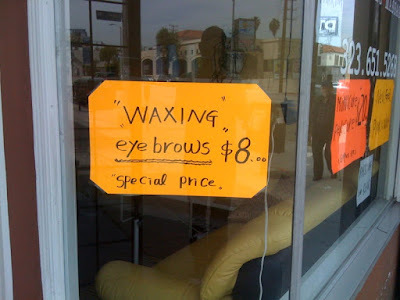 the word 'waxing' appears to have Two SETS of quotation marks above and below. You know i just realized.... do they mean they're actually GROWING eyebrows, as in the waxing moon or waxing poetic?